The U.S. Secretary of Labor is promoting workforce training and discussed the issue during a visit to Mississippi to tour the Continental Tire Training Center in Clinton. MPB's Desare Frazier reports. 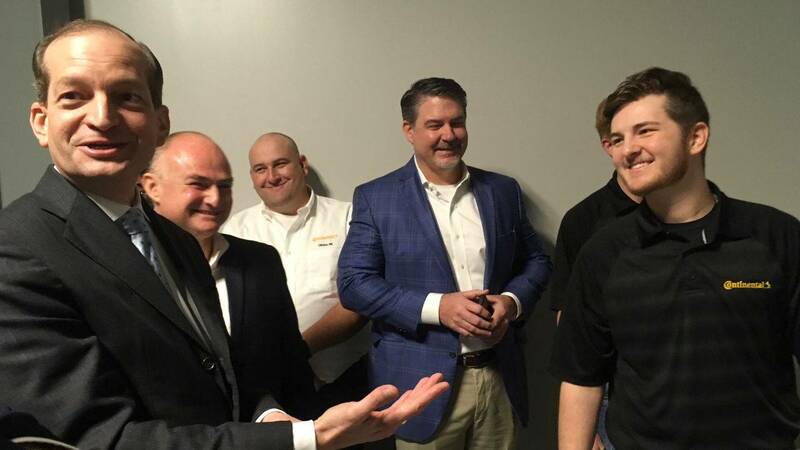 From mobility training to hydraulic and pneumatic systems, U.S. Labor Secretary Alexander Acosta is seeing how Continental Tire is using advanced technology to train employees at its Clinton Training Center. Joined by Governor Phil Bryant, Continental officials explain the partnership they have with Hinds Community College to prepare students for jobs. Acosta commended the college and discussed the critical need for workforce education. "We call it Demand Driven Education, education that responds to the demands of the workforce. They have developed new courses in partnership with business to make sure that their students receive the skills necessary for jobs like those right here," said Acosta. Acosta says it's important to expand how students are educated. He says high schools should offer shop classes, be exposed to trades like welding along with opportunities to go to college. Continental is investing $1.4 billion dollars in its high tech plant under construction on 700 acres of land. Michael Eigner, the plant manager, says they're in the midst of hiring and training employees. "We are at the moment hiring the people, training the people that's why we have this great facility in operation already to have really the possibility once the equipment is in to really hit the ground running," said Eigner. Eigner says they'll begin producing truck tires in January 2020 and eventually employ 2,400 people.